Progressive Democrats' pitch for a "Green New Deal" is short on detail but long on a hope it carries a heavy political punch. Proponents of the blueprint — which hypothetically constitutes one of the largest social and economic mobilizations since World War II — acknowledge that little action is possible until at least 2021, assuming a Democrat is in the White House. Until then, the creation of a select committee in the House will provide two years of messaging and consensus-building on climate change. But even without action, focus on such potent issues could provide a valuable platform for presidential candidates headed into 2020. 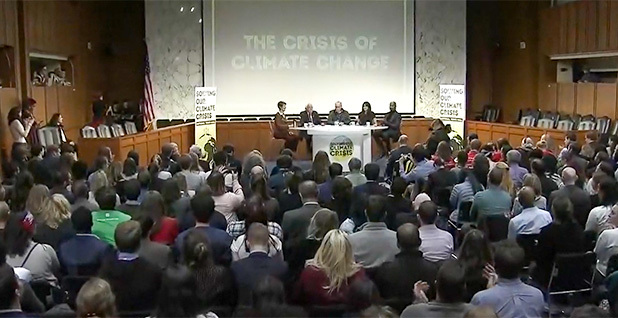 Evan Weber, co-founder and political director of the Sunrise Movement, a youth activist group backing progressives calling for a Green New Deal, said the main thrust of the special committee would be weighing ideas and crafting legislative language. It would also be building public and political consensus around what "needs to happen" to tackle climate change, he said. "It's not about passing anything," Weber said after a rally with Democrats on the steps of the Capitol last week. "These ideas are popular, and once Congress and the media highlight solutions that are going to make American lives better, it can help build political support to make this all happen," he said, adding that candidates from either party who embrace the platform "will find themselves on the winning ticket." Front and center is an ambitious resolution Democratic Rep.-elect Alexandria Ocasio-Cortez of New York has floated on her website. Among the asks: a shift to 100 percent renewables, construction of a national "smart grid," a federal jobs program with a minimum wage of $15 per hour and deep decarbonization across the entire economy. The overarching goal is to respond to a report from the U.N. Intergovernmental Panel on Climate Change, a consortium of experts from 40 countries, which in October warned that failing to cap warming to 1.5 degrees Celsius above pre-industrial levels would lead to catastrophic results as early as 2040. That includes worsening food shortages and wildfires and a mass die-off of coral reefs. What's not included, at least for now, are details on how to reach those ambitious — and possibly aspirational — goals. How would the grid be transformed to run solely on renewables? Is it technically feasible? What about the challenge of siting massive transmission lines? Would nuclear power and carbon capture be included? How would the government foot the bill? What is a national "smart" grid, exactly? Weber pointed to the select committee's openness to all ideas and said it would be up to the select committee and Congress to hammer out the definitive language. Sen. Ed Markey (D-Mass. ), who led the last climate change select committee as a member of the House, threw his weight behind Ocasio-Cortez's proposal yesterday. Markey and others have put ideas on the table. But the select panel could help push them together into the kind of broad action needed during the next few decades to address climate change, Ocasio-Cortez said last night at a climate change town hall with Sen. Bernie Sanders (I-Vt.). "There's a lot of work that has already been done, but it needs to be consolidated and brought under the tent of a Green New Deal," she said. "And when we try to solve this issue piecemeal, we are not going to get it solved in time." As for pushing 100 percent renewables, Weber pointed to a 2015 report from the Energy Department's National Renewable Energy Laboratory that found the United States could obtain up to 80 percent of its electricity from renewables without reliability problems. That study did not include a cost estimate. "There are questions about how fast we can get to that goal," he said, adding that there's a lively debate in academia. The point is that the United States needs to move more aggressively toward renewables given the threat of climate change, and it is moving too slowly toward a goal of something like 80 percent. Even without details on how to overcome those challenges, language in the Green New Deal is politically charged. Whether progressives will politically benefit from pushing for such ambitious but ill-defined goals is unclear. Kevin Book, managing director of Washington-based consultancy ClearView Energy Partners, said the United States has faced challenges before pushing through infrastructure proposals and federal renewable standards, but messaging without those details amounts to a powerful slogan for Democrats. "The definition matters. The idea, however, without definition serves as a particularly powerful rallying cry in wedge politics," Book said. "The idea of renewable electricity and a 100 percent renewable grid by some date certain, that happens to be outside the immediate window of political accountability, that's a very powerful rallying cry. It's not a very actionable, national plan." Others suggested the strategy could backfire, even if the Sunrise Movement and other activists have brought more focus to the issue. "It's not a substantive proposal," said Alex Flint, a former Republican Senate staffer and now executive director of the Alliance for Market Solutions, a conservative carbon tax group. "It's getting attention exclusively because of the tactics." Not everyone is convinced that the aggressive policy ideals laid out in the Green New Deal platform are widely popular. The problem, conservative climate hawks argue, is that the push by Green New Deal-backers could further polarize the debate by associating climate change with a broader set of progressive policy stances. During the past decade, Republicans have floated few serious climate solutions and allowed Democrats to sell themselves as the party that tackles climate change. That means there isn't much competition in the policy space, and Democrats aren't pressed to come up with detailed solutions. The Green New Deal is a perfect example of that dynamic, said Alex Bozmoski, managing director at republicEn, the conservative climate change organization founded by former Rep. Bob Inglis (R-S.C.). "When Republicans aren't on the field, Democrats can score on whatever play they call, even if it's a play that would be stopped by even a rudimentary defense," he said. Although it may juice the left side of the party, a set of "half-baked" policy proposals does little to move the ball forward on Capitol Hill, Bozmoski said. "How much is this going to poison the ability for bipartisan action on climate?" he asked. "I'm worried about overreach for Democrats toxifying the issue by deepening the perception that climate action is synonymous with a radical left-wing agenda." For Ocasio-Cortez and other progressives, though, giving climate change a prominent spot in the big tent of progressive issues is exactly the point. 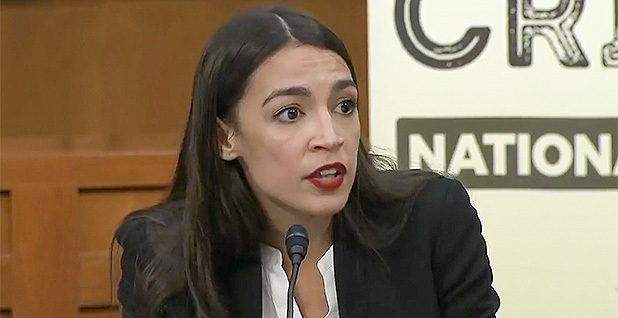 Ocasio-Cortez suggested yesterday that the Green New Deal is a starting point for a larger socioeconomic "moonshot" on par with the Great Society and the civil rights movement. "It's important to also talk about the fact that this is not just an economic solution," she said at the Sanders town hall. "This is the mechanism by which we can really deliver justice to communities that have been underserved." Even if the hard progressive policy proposals aren't there yet, it's "fantastic" for Democrats that young activists have thrown their weight into climate change, said Paul Bledsoe, an energy fellow at the Progressive Policy Institute who worked on climate change in the Clinton White House. "Thus far, the policy prescriptions have been less impressive. They have been really more a wish list than a serious policy platform," Bledsoe said. "So the challenge is to take the political energy and translate it into serious, actionable legislative proposals that can become law in 2021, which is the next realistic opportunity." Bozmoski, too, said he respects the Sunrise Movement's hustle and the pressure it has put on Democratic leadership to talk more about climate change. That pressure works in other ways, as well. Would activists, for instance, pressure progressives to vote against climate legislation that they think doesn't go far enough? "The thing to avoid is to have the perfect be the enemy of the good," Bledsoe said. But grassroots energy may be exactly what was missing from past congressional failures on climate change. "It's going to push on all members of Congress and state legislators in a way that they haven't been pushed before," Rep. Chellie Pingree (D-Maine), who has endorsed Ocasio-Cortez's select committee, said at a press conference last week on the steps of the Capitol. "And that's usually what moves legislation," she added. "That's usually what changes things, so I think we're in an entirely different era."